I will be speaking at this event jointly organised by the Bar Council National Young Lawyers Committee, Malaysian Centre for Constitutionalism and Human Rights (“MCCHR”) and Centre for Independent Journalism (“CIJ”). The purpose and intent of the forum is to have a general and critical discussion on the operation of section 114A, which was inserted by the Evidence (Amendment) (No. 2) Act 2012. 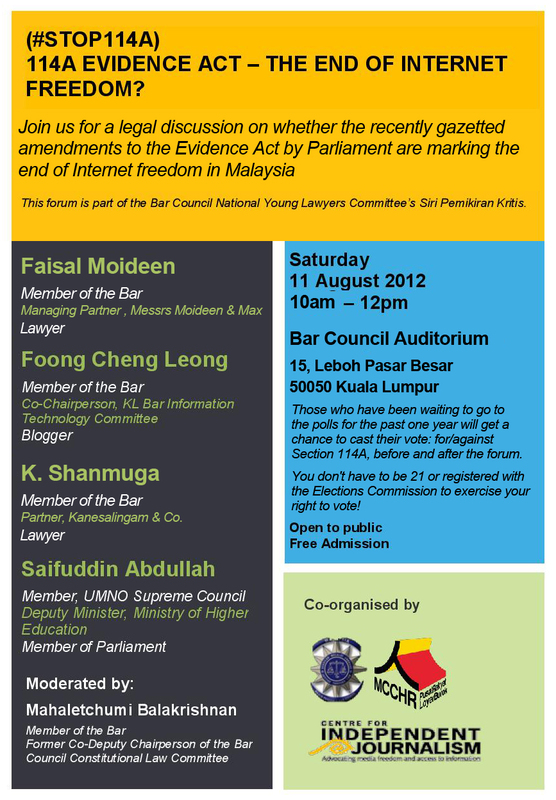 The forum will feature Faisal Moideen, Member of the Bar and Former Protection Assistant of United Nations High Commissioner for Refugees (“UNHCR”); Foong Cheng Leong, Member of the Bar, Co-Chairperson of the KL Bar Information Technology Committee and blogger; K Shanmuga, Member of the Bar, one of the founders of LoyarBurok and a mover for UndiMsia; and Dato’ Saifuddin Abdullah, member of UMNO Supreme Council, Deputy Minister of the Ministry of Higher Education and Member of Parliament. The session will be moderated by Mahaletchumi Balakrishnan, Member of the Bar and former Co-Deputy Chairperson of the Bar Council Constitutional Law Committee.